Heat milk in a saucepan. Add cream cheese, cream and blended cornflour. Stir all the time. Bring to the boil. Simmer till thicken. Season the salt and pepper. Heat olive oil in another pan. Fry the seafood and all the vegetables except the potatoes. Add into the cheese sauces. Divide the cheesy seafood into 4 ovenproof dishes or into a large casserole dish. 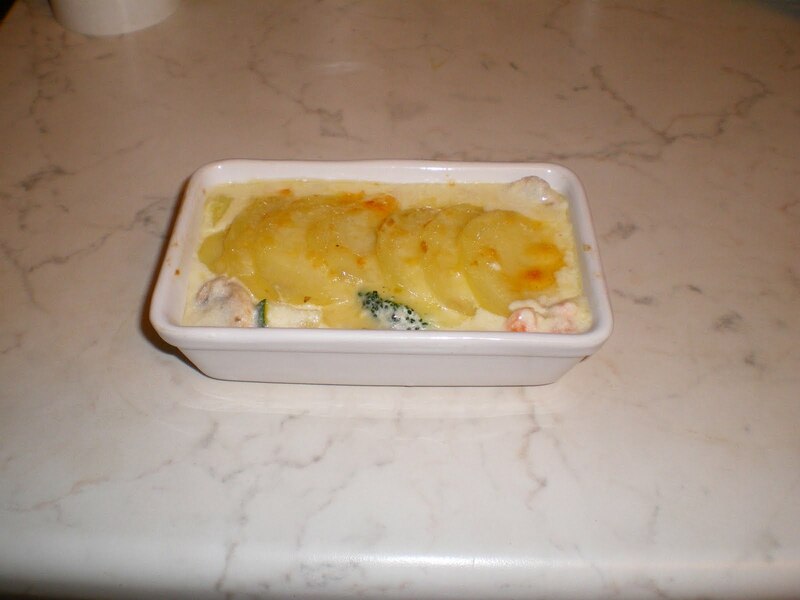 Arrange the potatoes on top. Sprinkle with the grated cheddar cheese. 6. Bake in an oven or 45 minutes Gas 4/ 180C/ 350F till golden brown.